Sometimes when someone tells you about a book, you have the feeling it’s practically written for you. 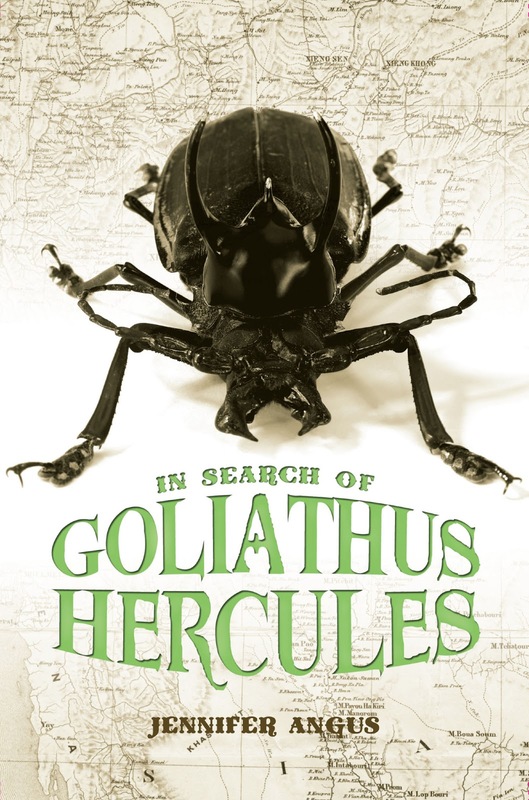 In Search of the Goliathus Hercules by Jennifer Angus is a Victorian middle grade fantasy about Henri Bell, a young boy who can speak to insects–which sounded tremendously exciting to me since I think insects can be quite beautiful. Added to that was the tidbit that Henri’s aunt is a button collector, and I was absolutely smitten! I had to have a look at this one immediately. This book is thoroughly charming, written in playful, friendly language with a real love and appreciation for curious minds, and it’s filled with whimsical scenes that catch the imagination. It’s the perfect, cozy book to read aloud at bedtime! We recommend this delightfully old-fashioned, intelligent book to those who love the inquisitive nature of The Evolution of Calpurnia Tate, the gentle, quirky humor of Roald Dahl, or the shivery insect scenes in The Cavendish Home for Boys and Girls. Her background certainly informs the book in a very tangible way, and as part of the official blog tour for the book, we’re very pleased that the author is here to share her experience with working with this unusual medium. Jennifer Angus on Collecting Insects! At the University of Wisconsin – Madison, I teach textile design. I am interested in the way pattern functions as a kind of language. Without written word a pattern can identify one’s gender, ethnicity, position in a community or even marital status. In the oral story telling tradition a pattern upon cloth is often the starting point for a very tall tale. The scale of a pattern is important too, smaller designs being considered appropriate for children and larger ones for older people or interiors applications. My work is dependent upon the supposition that there is a cultural understanding of pattern. When viewers enter one of my exhibitions, they are greeted with something they think they know, that is, a patterned wallpaper that might be in someone’s home. Surprise, surprise though! The pattern is created with one of the things most people don’t want in their houses – insects! Repetition is inherent to pattern and thus the notion of infinitude is closely linked, for when does a pattern end? 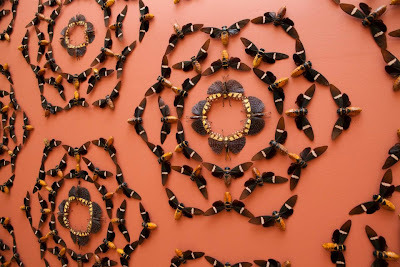 The connection I have made between insects and pattern is not arbitrary. Scientists have identified 950,000 insect species, and the beetle (Coleoptera) population alone makes up one quarter of the animal population. Presumably there are other species which have yet to be identified or to evolve, thus one could believe that discovery might continue to perpetuity. For many viewers of my work, the experience is overwhelming for one is literally surrounded by hundreds of insects in kaleidoscopic patterns. 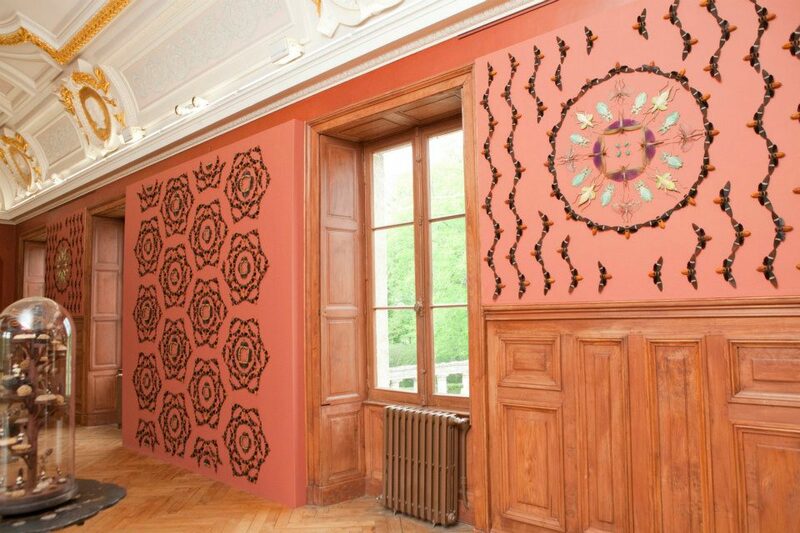 My installations are to some degree inspired by the wallpapers associated with the William Morris and Liberty companies of the mid to late 19th century. These companies created wallpapers and textiles that were lush and abundant with flora and fauna. My end result is a kind of Victorian fancy because I create over the top environments in which the evidence of “horror vacui” (the fear of empty space) is in full display. Emotions range and rapidly fluctuate from fear to awe to distaste to wonder. The beauty one observes in the pattern and the apprehension we feel toward insects creates a tension. For any collector one the dilemmas they face is the question of what will happen to the collection when they’re gone because often their family has no interest in it. As one nears the end of life finding a good home for their treasures becomes consuming. Henri Bell faces this question in the novel. Ultimately owning a collection is really about sharing and storytelling because often the history of the object or the story of its acquisition is more fascinating than the object itself. What is the point of owning something if you have no one to share it with? The blog tour continues tomorrow with a stop at Cecelia Bedelia! Win an autographed copy of this charming MG book! Thanks to Albert Whitman, we have one signed finished copy of the book to offer to our readers. This is a gorgeously illustrated hardback, and a lovely keepsake if you collect quality children’s books! 2. why you’d like a copy of this book! Open to US and Canadian residents aged 13 and older, or 18 and older with parental permission. Please see our giveaway policies for complete details. Contest ends 6/20/13. 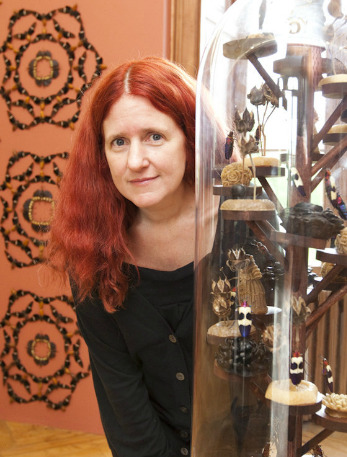 Jennifer Angus is a professor in the Design Studies department at the University of Wisconsin – Madison. She received her education at the Nova Scotia College of Art and Design (BFA) and at the School of the Art Institute of Chicago (MFA). Jennifer has exhibited her work internationally including Australia, Canada, Germany, Japan and Spain. She has been the recipient of numerous awards including Canada Council, Ontario Arts Council and Wisconsin Arts Board grants. Based on the storyline created for one of her art installations, In Search of Goliathus Hercules is her first book, and is available now. 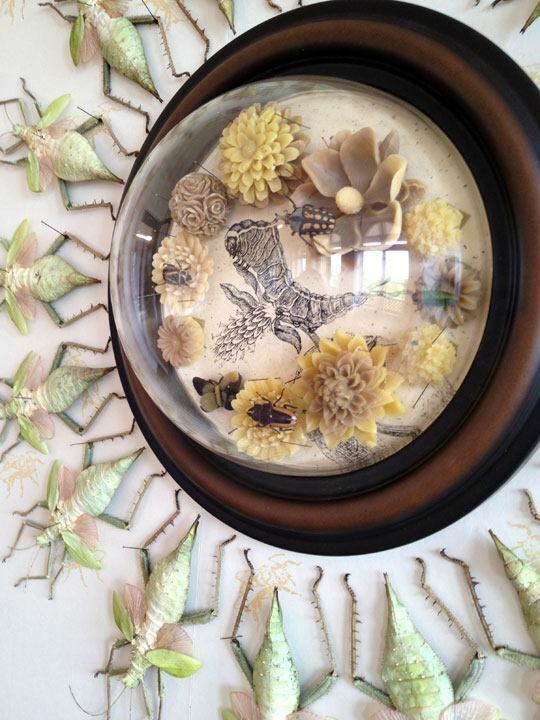 If you’d like to see some of her artwork – her medium is bugs! – please visit her website at jenniferangus.com. There are some great videos including interviews with Jennifer here as well. Our thanks to Albert Whitman Co. for providing the prize for this giveaway, as well as for a review copy. Photographs are courtesy of the author, publisher, or are our own. My final tweet: https://twitter.com/carlrscott/status/347759068980592640 Thanks for the giveaway, I’d love to win this great-looking book. Tweeted June 15: https://twitter.com/carlrscott/status/345933531228291074 Thanks! Wendy hooked me with the entire artwork bragging. The books sounds like it could be a real find. Wendy has also never recc’ed a bad book, to boot. I’ve been flailing over this book ever since you first tweeted about it, Ms. Wendy. Bugs and buttons and patterns – that combo can’t be beat! I’m not a fan of all insects, but I do think that the way she put them in patterns and displayed them as art is so beautifully fascinating. I’d love to see it in person, even though I’m sure I’d get goosebumps too! This is very eye opening, especially to me. I’ve never really thought of insects in an artistic way. It’s lovely to see people like her taking such an interesting perspective like this. Sounds like an interesting book! I love reading about Victorian books like this! So do I! I hope you enjoy this one, May. I could totally see my daughter with collections of butterflies pinned to her walls later in life. She makes her daddy catch every butterfly and moth she spots. :) And she tells me that they talk to her…that they tell her secrets. Yep, this is a definite possibility. :D And those collections in this post are stunning! Wow, what a seriously crazy book. I just finished another book with a lot of talk about insects, and the MC actually uses bugs as a part of her artwork (very coincidental!). But the wallpaper thing is very neat, actually. And the whole thing with hoarding is very accurate as well! Oh, Aneeqah–what book was this?! I’d like to read more about it, it sounds fascinating. I think book lovers can attest to the whole hoarders scare, when did we stop owning books and become owned by them we cry out loud…but it’s all show for our loved ones, because really we’re quit thrilled about our enslavement to literature. AHHHH! ALL THE BUGS! I have a bug phobia. Well not really. I just think they’re gross. But the pictures in the book look so pretty and some of those collection photos are stunning. Who would have thunk you can make things so pretty out of dead insects! Thanks for sharing ladies! I am squeamish when it comes to live bugs, too–but in this way, I can totally handle it! And I agree, it’s fascinating you can create something so beautiful out of what many people find to be so creepy. I am NOT a fan of insect encounters, but looking at those pictures made me realize that they can be interesting in a certain way. Hah, I like how you describe them as “insect encounters.” I know what you mean, and I am happier when they are safely…not active, too. Hah hah. I’m actually with you when it comes to live insects, Sam, but I find these preserved ones to be so interesting and lovely. I hope you do give it a try sometime! Agreed. Every page has gorgeous artwork, and none of it is repeated. This is all so beautiful. I’m not a fan of insects, but I love the artwork. It’s a fascinating medium, isn’t it? I wonder if there are other artists who do this. What beautiful work! I am not especially fascinated by insects, but my kids definitely are. I must keep this book in mind to share with them at some point. Thank you for sharing! Any kids who are curious about insects/nature/etc would love this, I think. :) I hope yours do, Andrea! Oh wow, this book looks gorgeous! I love the Victorian style stuff and this is definitely unique and different, which I love. I hadn’t seen anything like that art but I don’t think I’d mind some of it in my living room! I can just see my kids staring at it so hard they start thinking they are alive and moving. They are terrified of insects! I adore the Victorian era too–and yay for another friend who finds it beautiful! 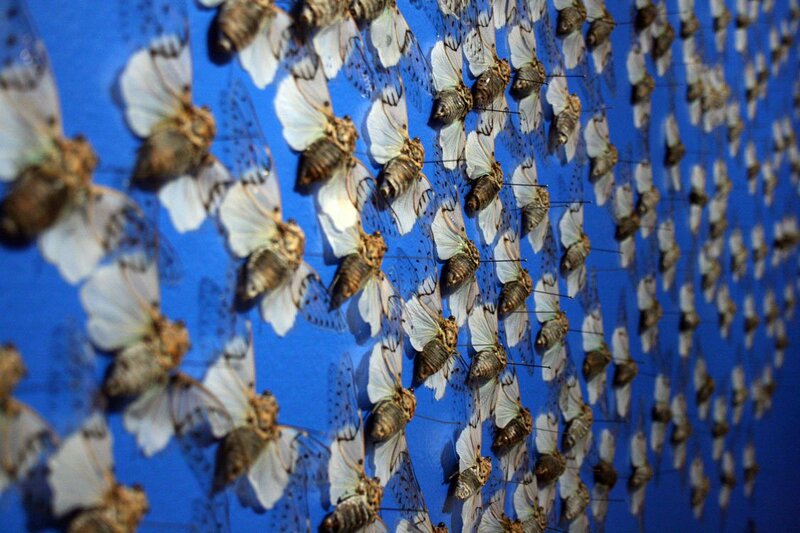 I have a few preserved insects myself, but I’d love a whole wall of butterflies or something, too. Kids would find it fascinating, I’m sure. Here is a link to my tweet! Oh, my email for the giveaway! This book sounds beautiful, thanks for putting it on my radar, Wendy! YAY! We’ve gotten a lot of shuddering readers here today, so I’m glad to see that some of my friends have an interest in this subject. 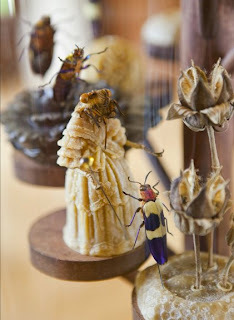 That is SO awesome that you were exposed to entomology as a child–I find them so beautiful, too. It’d be a lovely book to read with him. :) I hope you get your hands on this soon, good luck with your entry! Oh good! You’re a hard one to persuade, so I’m glad this book piqued your interest, Keertana. I actually had to look all over the place before I realized that the author had done the illustrations herself, Rachel–it’s an astonishing book in a lot of ways. My ver 3.0 will love this book. She’s always out by my roses talking to the bees. I’d never seen anything like this either, Carl! I am so sad I missed the LA exhibit, the museum is literally less than 10 minutes from me. Given your blog design, this book sounds perfect for you. I have nothing against bugs and the like. I mean, Charlotte’s Web is one of the best books ever! Yes, this book really is a perfect fit for me/us in so many ways. And I think sometimes as adults we forget what we liked as kids, so I hope kids find their way to this one. that is so different!! wow! When I first looked at the photos, the artwork left me speechless. I really, really want this book now so I can look at the illustrations in person! Do try to have a look at it at the bookstore or library, Lottie Eve! It’s quite possibly my favorite book design ever, even better than CAVENDISH, which I loved. And the photographs actually make sense and are striking images, unlike some other books where they’re more gimmicky. I actually like the interior drawings and design better than the one on the cover, Amy–it’s not as charming and Victorian as the rest, and I agree–I feel like it might turn some readers off it. But I hope kids will be drawn to it, at least! I was a lot less wimpy about bugs when I was little. But I was probably a lot more adventurous in general anyway. EWWWW bugs! I literally was cringing looking at the pictures. I don’t like bugs. LOL! Hah hah, I’ve been hearing how creeped out by this people are, which somehow surprises me! I don’t like them jumping and I wouldn’t really want to touch one, but I do find ones like this to be quite beautiful. Wow. Just…wow. That bug art/wallpaper is both fascinating and horrifying. (Sorry, bugs make me itch!) But the book sounds absolutely adorable! I love that the MC can talk to bugs. How many times have *you* wanted to be a fly on the wall, after all? Ah, flies can tell you so many things…especially these ones. 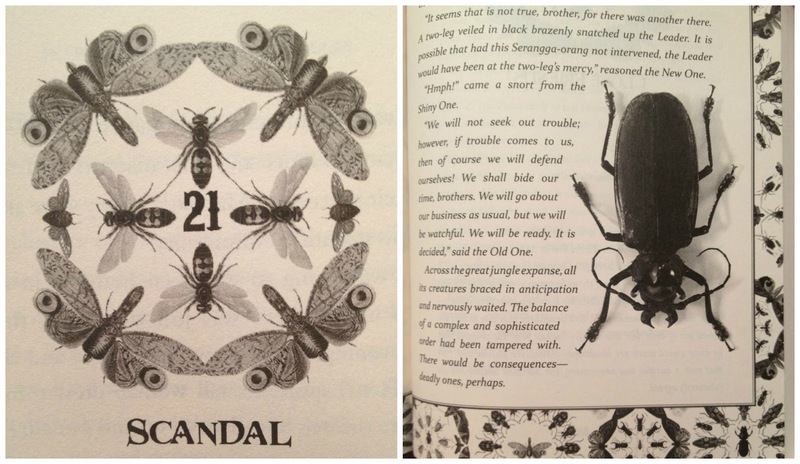 There’s a brief but poignant scene with one of the flies in this book, actually.